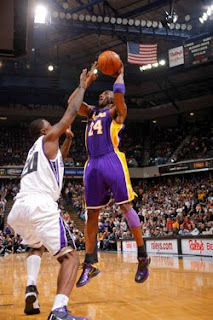 RANDOM ENTERTAINMENT: Kobe Bryant is a Warrior!!! Kobe Bryant is a Warrior!!! Phil Jackson offered an anecdote from Saturday night’s 112-103 double overtime victory in Sacramento that explained how Kobe Bryant feels about coming out of basketball games, no matter what the injury. Bryant, who had essentially been playing with his left hand before nailing back-to-back three-pointers in the second overtime, eventually figured out how to adjust his shot to the pain. Bryant didn’t go into as much detail.